24 hour Birdathon Team with Eve Meier, Patricia Lynch, and Dani Christensen. Click the button above to register for this team, or the button to the right to donate. Our goal is to find as many species as possible without getting back in our cars. 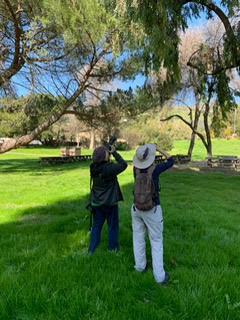 We will begin at Charleston Slough and will wander along Casey Forebay, Adobe Creek, Shoreline Lake, the gardens of the Rengstorff House, and Salt Pond A1; then return to our cars. Expect 5 miles of leisurely walking with several breaks. Participants do not need to stay for the whole event, feel free to return to your car as soon as your feet tire out. This Birdathon team is open to the public, registrants are asked to either donate or fundraise a minimum of $50 (registration for participants 18 years and younger is $15) over the course of the Birdathon window to support SCVAS education work.